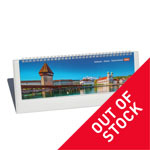 With more than 30 years of expertise in manufacturing office calendars, Falconmedia offers a series of high-end promotional desk calendars, entirely made in Switzerland. 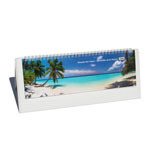 The elegant finish, practical format, functional aspect (3 months on a page) and quality of the images of our models will surely please your customers! Your logo and addresses are faithfully represented on both sides of the stand. 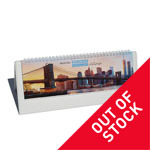 A greeting card and an envelope are shipped along with each model. We attach particular care to the choice of photos. The images are selected according to their ambience and exoticism. 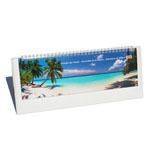 The desk calendar is a practical and intuitive tool, that is instantly usable. 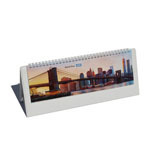 As such, it perfectly complements any electronic agenda and furthermore prominently displays your logo throughout the year.